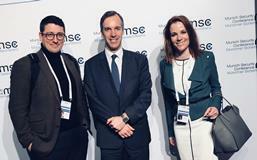 On 18 February 2018, the European Union Institute for Security Studies (EUISS) organised a side-event at the 2018 edition of the Munich Security Conference (MSC) at the Bayerischer Hof in Germany. The side-event saw analysts from the EUISS present a crisis scenario simulation and a walk-through of possible EU responses to the crisis. Inviting audience participants to actively engage in ‘grey swan’ thinking in an intimate setting, EUISS analysts showcased their work on strategic foresight and crisis management planning. MSC participants were pleased to learn of the EUISS’ strategic foresight work and copies of the ‘What If...’ report were well-received. The side-event was organised as part of the EUISS’ Memorandum of Understanding with the MSC.